Hello! Today I have a new Doodle Pantry image to show you called 'Red Hot Ants'. It is available in outline and pre-colored, and comes with several sentiments and two digi papers. To make my card, I used the outline image and colored it and cut it out. Yes, it was very hard to cut around those tiny little ant legs, but I really wanted to give the image dimension, so I did it! My sketch is by Splitcoaststampers (SC361). The heart is a pre-made felt one purchased at JoAnn's Fabrics and Crafts. The paper is Bo Bunny 'Crazy Love'. Doodle Pantry is having a 50% off sale today through the 31st, so be sure and go and check it out! Hello! I hope everyone had a very Merry Christmas yesterday. 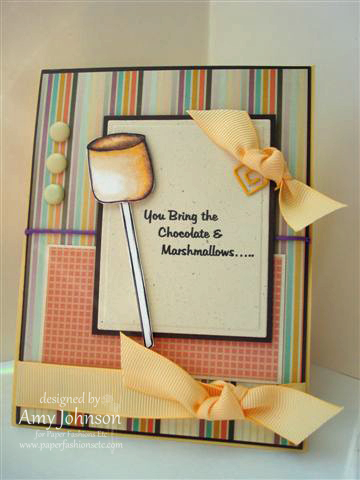 Today I am showing you a card that uses images from the set Paper Fashions Set 'Everything on a Stick'. This set includes images of just about anything you'd see at the end of a stick: a Lollipop, a PinWheel, etc. Today I am using the marshmallow image. To make my card, I created my own sentiment and printed just part of it on Natural Ivory Card Stock. I printed, colored, and cut the marshmallow out and popped it up on dimensionals. The sketch is by Taylored Expressions (TESC148) and the paper is Cosmo Cricket 'Joy Ride'. Here is the inside of the card. I created my own sentiment and printed it on the computer. The 'S'more' image is retired Stampin Up!, but you can also get some great 'S'more' sentiments and images from Paper Fashions HERE. Well, I'm sad to announce that today was my last Paper Fashions Post. I decided to step down because I'm already on two other design teams, and with working Full Time life is just a little too busy. I found I was spending my days off frantically working to meet design team requirements instead of doing what I really needed to do or what I really wanted to do. Hello! I hope everyone is having a wonderful Holiday weekend. We won't be celebrating Christmas until Wednesday, because that is when my daughter and son-in-law will be arriving. So I have the whole weekend to craft! In honor of Christmas, I held off my Doodle Pantry Post until now. I decided to use this fun image from 'Sledding Ants'. The sketch is by Splitcoaststampers (SC363) and the paper is DCWV 'The Christmas Matstack'. The snowflakes are pre-made from JoAnn's Fabrics and Crafts. The main image panel is up on dimensionals. Ribbon, Martha Stewart Baker's Twine, and a tag were added for embellishment. I hand wrote the 'Wweee!' sentiment on the tag with a white gel pen so that it would fit, but it also comes as part of the set along with three other sentiment. Hello! 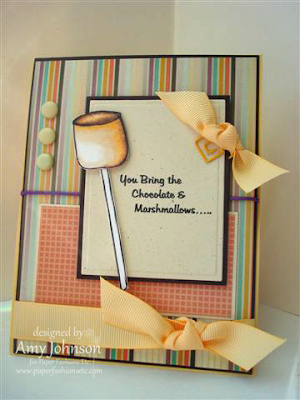 Today I have another card to show you that uses an image from the Paper Fashions set 'Everything on a Stick'. This set has all these different images of things that come on a stick. Last week I showed you the Lollipop image HERE. This week I'm using the Pinwheel image. I printed the image twice on designer paper, then I cut both images out, and popped the image up twice on dimensionals: First I popped up the pinwheel, then I popped up just the inner layers of the pinwheel. The sketch is from Clean and Simple and the paper is from Cosmo Cricket 'Togetherness'. I added a black brad in the center to make the pinwheel look more realistic. The sentiment is from MFT and the inside of the card reads 'Hope Your Birthday is the Best!'. Hello! As promised, here is the long awaited post of My Craft Room! This room has been a dream of mine for over 20 years! I had to wait until the first kid got married, and the last kid went off to college before we could build this room. I've been designing it and dreaming about it for 20 years, and I'm happy to say it is finally done! It's a very large space that sits under the balcony of my upstairs family room. It is 24 feet long and 16 feet wide. You can see the entrance to it in the second photo above. The fabric separates the room from the sun room, but it also serves to help keep the room heated in winter. On very cold days, I can close the curtains and just heat the craft room and not the entire sun room. The second picture is what you see when you enter the room. Everything is custom made by my husband. The desk is HUGE! It's 97 1/2 inches long and 49 1/2 inches high. I work primarily in this space so I had my husband build it BIG! I decided to stain the desk a dark walnut and paint the cabinets an antique white. Although most of you know me as a paper crafter, I do a lot of different crafts and so the room has to function for a variety of different crafts. Below is a picture of a little cart just on the inside wall which holds a lot of tiny fabric pieces for quilting and sewing. Here's the left side of the room. This would be my 'Paper-Crafting' side. It holds all my supplies for paper crafting in the cupboards and underneath the counter. This Cricut Stand is the only furniture in the room that was store bought. I purchased it at JoAnn's Fabrics and Crafts. I use it to hold my large 12 x 12 solid color paper. It's also my embossing station. I had my husband leave some openings in the shelving for decorative reasons, but the decorations still provide storage. I bought dozens of these little baskets at JoAnn's, this one holds buttons. And the silver tins are loaded with Prima Flowers. If your wondering about the greenery, that's only there because it's Christmas, and I decorate every room in my home for Christmas. The decorating theme of the room is birds; since the room is connected to my sun room where my 'live birds' are and there is a view of my garden where the outdoor birds are; so you will see lots of subtle bird images as we move about the room. The next two photos show my 'Cuttlebug Station'. The Cuttlebug sits permanently on the counter top because I use it everyday. In the cabinetry above are folders of all the Cuttlebug dies and embossing folders I own. I also keep my 'Bind it All' and 'Coluzzle' here along with other miscellaneous things. I decided not to have any lower cabinetry in my craft room, and I just hung curtains. I wanted to have a space to keep all my rolling paper totes and other large items hidden. This beautiful blue material is 100% silk, and would you believe I purchased it for only $3.00 a yard at JoAnn's? It was one of their red tag home decor fabrics that happened to be 50% off the already reduced clearance price. This little compartment is one of those little tool chests you can purchase at a hardware store. It's perfect for holding all the little things crafter's use. I keep it right on top of my counter top where everything is in easy reach. Here is how I store my clear acrylic stamps. They are just in baskets inside a cupboard, sorted by manufacturer. I store my ink pads in the same basket. Each basket holds a different color group. I bought all these different sized paper mache bird boxes from JoAnn's. The colors were the inspiration for the colors in the room. Every box holds fabric. I probably have enough fabric to open my own fabric store. I have about 7 of these little plastic boxes, I keep them underneath the counter on top of the filing cabinet. They hold all my brads. You can find these plastic boxes in the beading department of JoAnn's. This is how I store I cards after I make them. It's a large CD/DVD plastic tote purchased at JoAnn's. It comes with dividers, but I added more to separate all the cards by theme (like birthday, anniversary, etc.) I keep this box under the counter top too. This is how I store my 8 1/2 by 11 color card stock. The filing cabinets fit nicely under the counter top. All my ribbon and trim extra pieces are wrapped on small pieces of chipboard and placed in baskets and sorted by color. This basket contains my white lace. Nothing goes to waste when your a paper-crafter. Most of these items are just leftovers from sewing projects, which will now probably go on a card someday. I'm not a hoarder by nature, except in my craft room. I throw nothing away, because I will never know if I will be able to re-purpose or re-use the item again. This cupboard contains all my embellishments like trims, Prima Flowers, and dew drops. Now we are in the center of the room, which starts the 'sewing portion' of the room. Here is my custom built sewing center. The sewing machine sits on a shelf which actually pulls out from the wall so if I ever need to sew something that has a lot of material (like curtains, or a quilt), I can just slide the shelf out, so the material will flow behind the machine. Above the machine I have more decorative boxes which contain fabric, and some cute sewing themed decorations. There are drawers on the lower part of the cabinetry which holds all my sewing notions. Opposite my sewing station is my desk. This is a close up of my desk, what it looks like everyday. I had my husband build a little wooden wall to cover the front of the desk so you can't see the mess when you walk into the room. I love to have everything I use everyday in easy reach, but I don't want to see the clutter from the sun room. This is my view when I sit at my desk. I have a plasma T.V. hanging in the corner, and I can also see out into my garden. There is not one bit of unwasted space in this room! My husband even built shelving underneath the desk for storage. It holds more papers, chipboard, glitters, wooden stamps, etc. Crafter's can never have enough storage! The right side of the room is mostly for sewing and flower arrangement supplies, although I still have a lot of paper-crafting supplies over there too! This is how I store my ribbon spools. I bought the Ribbon Holders at JoAnn's. They are only available for purchase around Christmas time. Underneath the counter holds more fabric, and unfinished sewing projects and floral supplies. This is how I store SOME of my Spellbinder's Nestabilities. I still don't like it. I really wish that company would sell their Nestabilities in CD cases to begin with, or provide an effective storage solution for their customers to purchase. The CD cases I have, aren't real CD cases, they are the single computer disc kind, so the Nesites don't fit well inside them. I can't find real emty CD holders that are inexpensive. I tried puting my Nesties inside portable CD holders too, but it gets too thick too fast. So, I just struggle with this system for now, but this still isn't all my Nesties. Alot are in their original packaging in desk drawers. These are all my cutting mats and rulers which sit next to the sewing station. Here is a closeup of one of the ribbon spool containers. Here's how I keep alot of my embellishments. They are all sorted into baskets and put into the upper cupboards. This is the far right side of the craft room wall. I have more display cabinetry. That is one of my scrapbook pages on my shelf. I have a Susan Winget Calendar on the wall that matches all the Susan Winget paper mache bird boxes. This was one of my Christmas Presents that I bought for myself on Black Friday. It holds a large assortment of Gutterman Thread. I'd love to hang it on the wall, but I don't have any wall space left, so it sits atop an antique sewing machine. This is what the room looks like if you enter it from the right side. I display just a small portion of my wood rubber stamps in these antique printer's trays that my husband mounted to the wall for me. The buttons and large scissors were purchased at JoAnn's. Below is my Cutting and Scoring Station. It sits on top of an old desk that my daughter won't let me throw out because she 'might want it someday'. So I covered it with leftover blue silk to hide it. I still use the drawers of the desk though! No space goes to waste! I hope I gave you some ideas for storing your paper crafting things! I know my room is extreme, but I waited a long time for it. Like many of you, I started crafting on my dining room table, and my storage space was what I could squeeze in some little totes and shove in a tiny closet. Then as the years went by, I just kept 'accumulating things', and gradually went from crafting on my dining room table, to crafting in a large walk in closet. I stayed 'in the closet' for about 12 years, and finally was able to have my own room. So for all the young crafter's out there who are frustrated having to work on a dining room table and always having to clean up a mess instead of being able to just leave it and walk away; take heart! I know how you feel! I was there myself! Someday, you too will have your own craft room! Hello and welcome to another Digital Tuesday Challenge. This week's challenge is 'Winter Wonderland': Simply make a card or project that showcases winter and be sure to use at least one digital element. Our sponsor this week is Robyn's Fetish. To make my card, I used the Robyn's Fetish image "Home for the Holidays'. My sketch is by The Skipping Stones (#105) and my paper is My Mind's Eye 'Signature Christmas'. I cut the snowman out and popped him up on dimensionals. The snowflake is from JoAnn's Fabrics and Crafts. This will be my last Digital Tuesday Challenge post for three weeks. The gals are taking a Holiday Break. We will resume the Challenge Post on January 10th, 2012. Hello! Today I have a Paper Fashions card to show you that uses an image from a new set called 'Everything on a Stick'. This set comes with many different items that can be put on a stick, like a lollipop, balloons, an umbrella etc. It's such a cute idea! To make my card, I used the lollipop image and a sketch from I Love Sketches. My paper is DCWV 'The Sweet Stack'. I cut the lollipop out and covered it with glitter and then popped it up on dimensionals. The sentiment is computer generated. Hello! Today I have a couple of very simple Christmas treat holders to show you. I got this idea from someone else's blog last year, but I can't find a link anywhere nor do I remember who's blog it was. So if you recognize this idea as your own, let me know so I can give you credit. These are so simple to make. You just make a square base and add a paper handle. The snowman is a pre-made felt piece from JoAnn's. I could have made a fancier tag, but kept it simple because it's a busy time of year. And here's the Penguin felt piece, also purchased at JoAnn's. Hello and welcome to another Digital Tuesday Challenge. This week's challenge is 'Lights'. 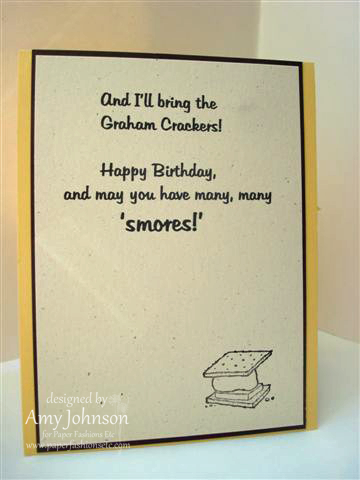 Simply use candles or some type of light on your card or project and be sure to include at least one digital element. Our sponsor this week is Fred, She Said. For my card, I used the Fred, She Said image 'Christmas Poinsettia Lantern Set'. This set is available in black outline and in color, and comes with the beautiful distressed scripture passage you see in the background of my card, plus several sentiments. My sketch is an old Verve sketch. I put Stickles on the flame on the candle and on the flowers. I printed the image twice and the flowers 3 times, and popped everything up on dimensionals. If you'd like to play along with us this week, simply click on the Digital Tuesday Challenge Blinkie in my sidebar and it will take you directly to the Challenge Site with further instructions. Hi! I've had a rough day. I woke up at 6:15 a.m. to sing at church. After church I went Christmas shopping for one hour before I had to head to work. I worked till 9:00, and although I'm a very good driver, I was in a hurry to get home so I set my cruise for 59 mph even though it was snowing. The roads did not appear slippery at all. Next thing I knew, my car accelerated on a curve and the car went out of control. I couldn't slow it down or get it back in control for anything. I fish tailed numerous times, then I just started spinning in circles, and finally the car just flew off the road and into the air and five feet down an embankment. Miraculously both me and my car came out of without a scratch, but my pocket book is now $200.00 dollars poorer because I had to call a tow truck. I'm so mad at myself. If I hadn't set my cruise, none of this would have happened. It took me two extra hours just to get home. I'd be in bed in right instead of writing this post. Ugh!I know I should be grateful it wasn't worse, but all I can think about is the loss of time and money. But everyone was sure nice and helpful. Two good Samaritans stopped and tried to help me. One even tried to drive my car up out of the ditch, but that was obviously impossible. Two sheriff officers came by and were very sweet, and the tow truck driver was very nice too. No one made me feel stupid, and everyone said there were multiple accidents tonight. Anyway, onto my card. The Christmas Tree image is from the set 'Wrapped in Love' by Paper Fashions. The sketch is by MFT (MFTWSC46). The paper is My Mind's Eye 'Twelve Days of Christmas'. The sentiment tag is actually a button I purchased from JoAnn's Fabrics and Crafts. I put Stickles on the Star and added a sparkly ribbon and adhesive crystals for embellishment.